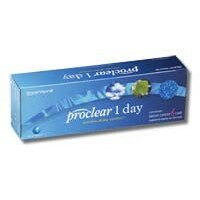 Proclear 1 Day Disposable Contact Lenses from Cooper Vision. If you wear disposable contact lenses, you value convenience. And because one day contacts are replaced each day, they're also the healthiest lens option. But you may not know that Proclear 1 day contact lenses also have the added benefit of exceptional all-day comfort. Our PC Technology™ creates a lens material that contains molecules found naturally in human cell membranes. These molecules attract and surround themselves with water, keeping your disposable contact lenses moist and comfortable, even after 12 hours of wear. So you’ll get all the convenience of a daily disposable in a lens that lasts all day long. Proclear 1 Day lenses are the only daily disposable contact lenses with a FDA clearance for the claim: "may provide improved comfort for contact lens wearers who experience mild discomfort or symptoms relating to dryness during lens wear."